Is Windows Phone an upgrade from Symbian? Amid all the anticipation and speculation surrounding Nokia’s Windows Phone handsets, you’d be forgiven for thinking you have to move with the times and give up your staunch Symbian sidekick. Don’t be in too much of a rush though; while Windows Phone will improve over time, things aren’t all that rosy on the Redmond side of the fence. 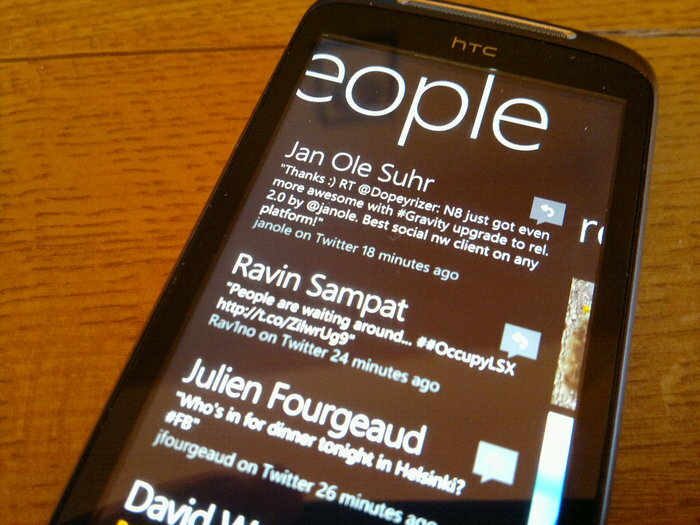 Note: All comments in this article are based on my tests of Windows Phone Mango running on the HTC Mozart. I'm writing this from a perspective of a Symbian power user, which obvisouly has big impact on my viewpoint. It’s not surprising that Windows Phone has grabbed the imagination of technology bloggers, journalists and enthusiasts alike. We have all been collectively holding our breath for something different to come along and replace the likes of iOS and Android. And yes, had Nokia released something like Symbian Belle eighteen months ago, then this article could have been telling a very different story. It’s hard not to be enticed by the buttery smooth animations and transitions in Metro UI. While I did jokingly say on Twitter that “a bunch of squares” was an appropriate design accent for Microsoft, it does all work very nicely. Indeed, doing the basics like making a phone call or sending a text message really does feel like a futuristic experience. However, once you get past the feature phone functions, things start to feel a bit different. Windows Phone uses a lovely font that is very clear to read. Even when the font sizes are getting a bit too small for even my eyes, I can still make out the clean curves of every letter. However, it’s the font size management in Windows Phone that is one of the most obviously silly problems with Metro UI. The design of menus and lists in Windows Phone works on scrolling sideways to move into either sub-menus or sub-categories. With this in mind, main headings are deliberately oversized so that they slowly pan across the screen. That’s fine since you don’t need to see the whole heading to know the context of what you’re doing. The real problem with heading sizes presents itself when, for example, you browse applications in the Marketplace. In such contexts, the title of each list item isn’t obvious, yet their text is so large that it can’t all fit on the screen. Windows Phone fans have told me to “just drag sideways”. However, since the Mango update, headings are actually clipped at the screen edge. Therefore, non-obvious information is being lost. While Windows Phone is doing very well to have so many applications at such an early stage, it is still an immature ecosystem. E.g. it lacks applications for mainstream services like Skype and PayPal. The Marketplace is not completely reliable either. Half of the time I try to buy or download anything I get a “Service unavailable” error. There is a confusing division between payment methods too. As you would expect, when purchasing music or applications on the handset for the first time, you’re asked to supply your credit or debit card details. 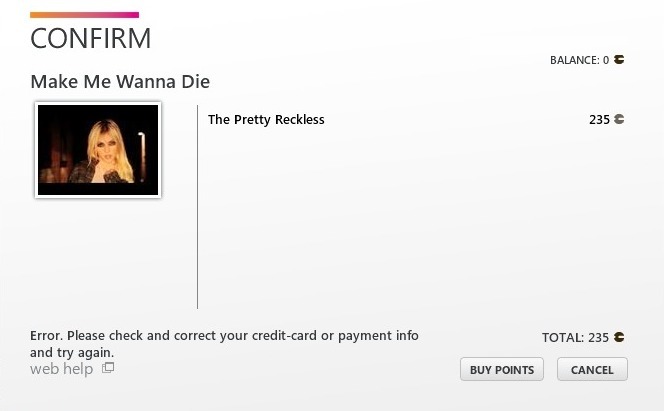 However, if you try to purchase content on the Zune Desktop application, you have to buy Microsoft Points. Ironically, every time I tried to do that, I was told that my card details were incorrect. However, those details are attached to my Windows Live account, with which I'm currently buying applications! Lastly, many of the applications I’ve tried on Windows Phone still have something of an amateurish feel to them and often crash. I don’t wish to do a disservice to anyone, but I think many developers are still figuring out how to get the best from Windows Phone and its APIs. 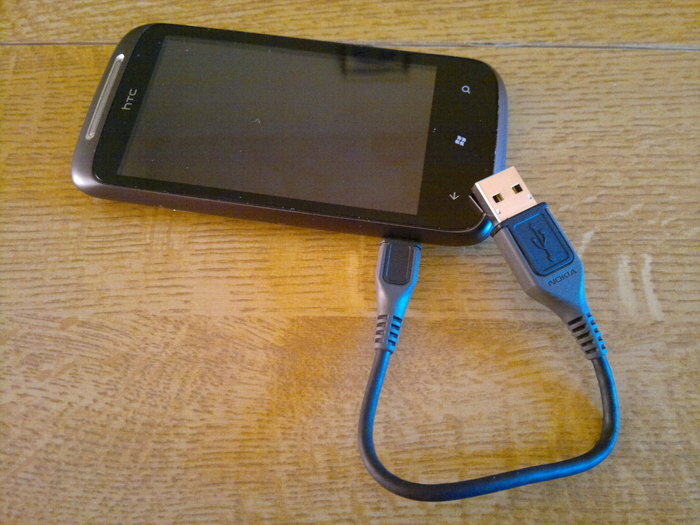 We’re all accustomed to using our smartphone as a removable USB drive. Well, apart from the iPhone users, but we won’t go there. Windows Phone has done away with this feature, to the point that even memory cards are not interchangeable. This exclusion of a universal standard means that transferring media to the device becomes a convoluted process. Everything has to be transferred via the Zune Desktop application on a Windows PC. Mac users can use a smaller and simpler 'Mac Connector', but the principle is the same. Linux users are completely left out in the cold - there is currently no way to use a Windows Phone phone with Linux. Apparently our money isn’t good enough for Microsoft. To transfer music to your device, you can’t even drag and drop files from a removable drive into the Zune Desktop application. Files have to be stored on a fixed drive, in the designated folders, which are then catalogued and available for drag’n’drop. In the case of videos, you have to wait for them to be transcoded before they are copied to the phone. At least Zune Desktop takes care of these steps by itself (interestingly, the Mac Connector has a small 'opt out' preference for this transcoding - Ed). I’m sure that many S60 users will remember having to figure out the transcoding on their own, before being able, in recent times, to simply copy a playable video to their phone. Symbian^3 now incorporates fantastic codec support. That meant we could drag’n’drop almost any video and get on with our day. Windows Phone’s requirement to convert video is a step backward, and will represent a significant delay to people using low cost laptops with modest processing power. The People Hub is one of the unique selling points of Windows Phone. It’s a fantastic idea that I look forward to seeing mature. There is clearly an irony to making any complaints about it, when we’ve had to endure Nokia Social for the past year! Previously, the Hub only supported Facebook, but Mango added support for Twitter and LinkedIn. Integrating social networks into the core of a smartphone is implicitly saying that there will be no need to install third party applications. Otherwise, what would be the point of it? Therefore, the People Hub, by intention, sets itself up for needing to be perfect. However, it is missing important features from every network. Most notably is private message support, which I assumed would be part of the contact conversation view. People who use Twitter Direct Messages or Facebook mail will still have to use third party applications. Which brings me back to the point - If you’re installing a third party application for social networks, there’s no point in having the People Hub any more! Another thing that Windows Phone does very well, is integrating and displaying photos stored on the device and Facebook. It seems a crying shame that Flickr was not built into the People Hub. Instead, the official application replicates the functionality of Windows Phone Pictures, just for its own content. Perhaps it’s just me, but seamlessly integrating Flickr into the Pictures application seems too obvious to miss out. Windows Phone Mango was supposed to introduce multitasking, and most people will tell you that it did. Based on my experience of Mango, I find it questionable. Applications do not run in the background, they are tombstoned; i.e. frozen. For example, if you’re using something like a third party podcasting application, you have to wait for the content to download before you can move away to another screen. After having come from Symbian with true multitasking, and Android with good enough multitasking, Windows Phone’s implementation looks very halfhearted. While Mango did bring in background audio playback, which third party applications can use, more background services are needed! The task switcher view has an interesting way of listing open applications. Rather than showing previews of all the applications you’ve been using, it shows something akin to a browser history. This leads to multiple instances of the same application being shown. I can see the logic, but I think it will confuse most people. The Mango update brought Live Tiles, which is Windows Phone’s version of widgets. These work nicely for some things, e.g. unread message counts. Symbian has widgets that cover the same functionality, but unlike Windows Phone, its calendar widget shows events and To-Do items. Given that the function of a smartphone homescreen should be to display glanceable information about your day and your device, this is a serious omission from Windows Phone. 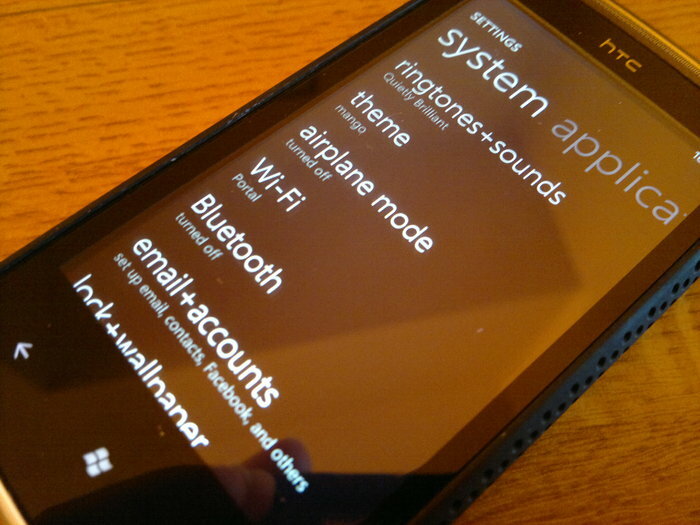 The settings menu of Windows Phone is an improvement on Symbian’s, mainly due to its lack of sub-menus. However, it isn’t alphabetically sorted, which means nothing is quick to find! Power management seems to be quite poor too. 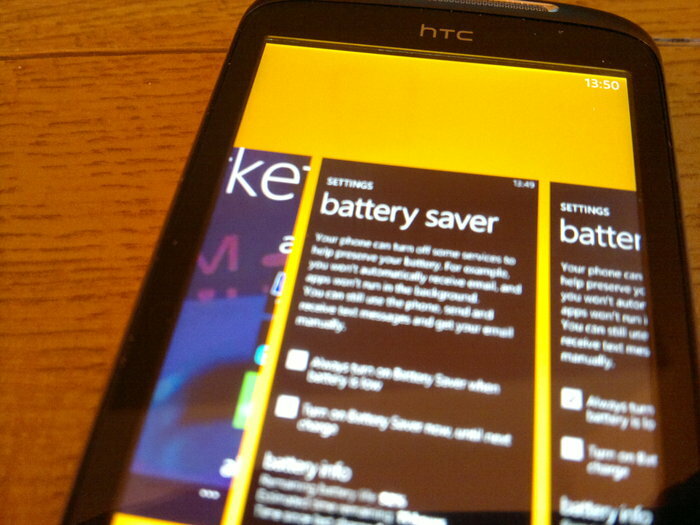 I have only tested Windows Phone on HTC phones, which are notoriously poor for battery life. However, the HTC Mozart on my desk seems to go through 10% per hour under light use. This is an area in which I hope Nokia will be MUCH better! Mango's setting menu - no logical sequence! Windows Phone is still young, and so I hope that everything I’ve mentioned will be fixed. Yes, I consider the lack of USB mass storage compatibility to be a bug, not a feature! It’s a shame that Windows Phone is undermined by such problems, because the operating system looks and feels great. I understand why people are excited about it; the iPhone proved that some people appreciate form before function. However, Windows Phone Mango is still not ready for power users. It has a strictly prescribed usage pattern, which in some cases it fails to operate within. Users who want freedom and flexibility will still be disappointed with Windows Phone. 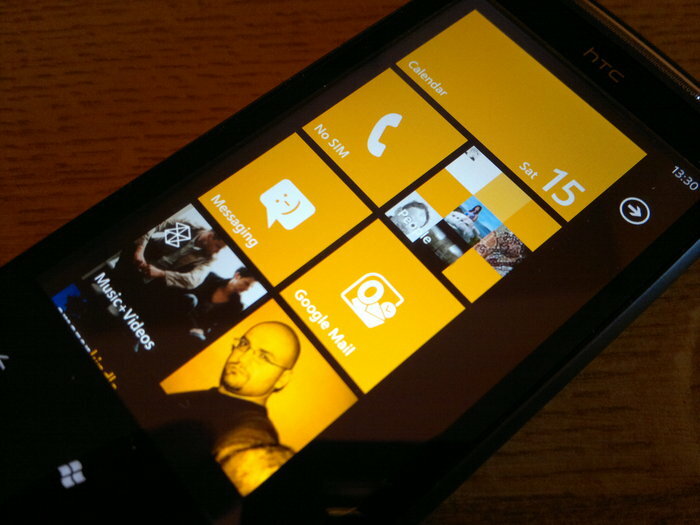 Filed: Home > Features > Is Windows Phone an upgrade from Symbian?